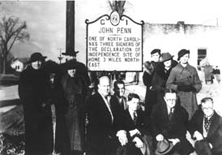 he North Carolina Highway Historical Marker Advisory Committee typically meets twice each year, near the end of the academic semester in the spring and in the fall. The members review applications received and determine the wording on new markers. Click here for a list of the most recently approved markers. More details about each can be found in the respective web pages for the signs. Local parties have the responsibility for planning dedication and unveiling ceremonies. Click here for a list of recent and upcoming dedication programs. The public is invited to attend these events. Reference the Contact button if you wish to get further details.